A Nexus Account: our SDK is available on a private Nexus. Your account details have been communicated to you by email. Your SDK credentials: including an SDK Login, Password, and Company Key to initialize the SDK. An Android Device: an Android device with camera and an NFC reader. 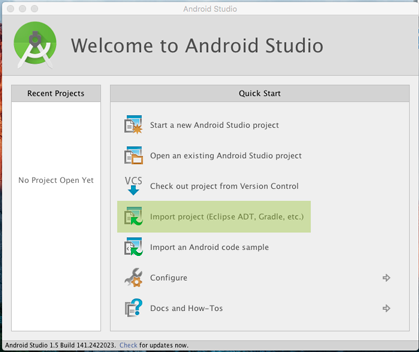 The Android Studio application: which you can download from the Android Developers website. Check that your Android SDK is up to date. In the Android Studio Wizzard, click on import project. Or, if you already are inside an Android Studio project, go to "File > Open"
The code of both activities is identical: ActivityQrNfcFgBg is simply an extension of ActivityQrNfcFgOnly. However, the Manifest configuration for both activities is different: the ActivityQrNfcBg class declares two additional intent-filters, which enable it to take control of Android’s default actions to read QR codes and NFC tags. When the application is installed, launch it and flash the QR code you received from Connecthings. ActivityQrNfcFgBg is launched: this triggers a connection with the Herow platform to retrieve the content corresponding to the QR code. Once the content is retrieved, ActivityContent automatically opens. In QrNfcDemo, open the manifest file. ActivityQrNfcFgBg is launched: this triggers a connection with the Herow platform to retrieve the content corresponding to the NFC tag. Once the content is retrieved, ActivityContent automatically opens. Android:host appears on two different lines of code: do not forget to update both lines. Be sure to use the good access key login / password with the appropriate platform - for each platform (Pre-production/Production) you have received a specific access key. Connecthings sends you a user to connect to the Herow Platform and a user with an API KEY to be used with the SDK. Be sure to use the user with the API KEY to connect the SDK to the Herow Platform, otherwise the application won't detect the beacons. Connecthings sends you two different access keys for each platform: - An access key to sign in the Herow Platfrom - An access key to use with the mobile SDK, called API_KEY. Be sure to use the correct API KEY (login, password, and platform) to connect the SDK to the Herow Platform, otherwise the application won't detect the beacons.